After having a surprisingly unattractive website on the Star Spangled Banner for years, the Smithsonsian Institution unveiled a new one last year. It’s called…The Star Spangled Banner. The new site coincides with the opening of a new physical gallery about the flag. The site is much more accessible to English Language Learners than the previous one. There’s relatively simple text, it talks both about the War of 1812 and the flag, and there’s a good quiz and a feature where you can interact with the flag itself. 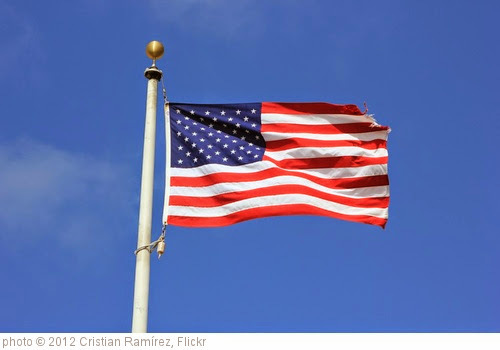 Flag Day 2011: Which Star Is Your State? is an interactive from The Huffington Post. Giving Old Glory its final due is a Washington Post slideshow. Five myths about the American flag comes from The Washington Post. This video shows all the variations of the U.S. Flag during the country’s history. Long May She Wave Flag Video from Studio Hinrichs on Vimeo. Here’s a History Of The American Flag interactive. Learn about the Star-Spangled Banner from The Smithsonian. For Flag Day, watch how much the American flag has changed is from Vox. Happy Flag Day. But Are You Flying It Wrong? is from The NY Times. You might also want to explore the 450 other “The Best…” lists I’ve compiled. Previous“Children living in areas where homicides committed have lower reading, verbal test scores” — Ya’ Think?